Ash: You still don't know what you're dealing with, do you? Perfect organism. Its structural perfection is matched only by its hostility. Ash: I admire its purity, its sense of survival; unclouded by conscience, remorse, or delusions of morality. Today�s multiplexes seem to abound with sloppy horror pictures that draw large crowds but lack the ingenuity of their inspirations. These eighty-minute slasher pictures jump right into the action and forget to generate any caring for their victims. The characters are usually very young and exist as specific archetypes from countless past movies. The studios love these projects because they can use a virtually unknown cast, keep costs low, and make a fortune from the masses. Horror films do serve a purpose and can provide chilling entertainment, but far too many duds appear for every solid entry. 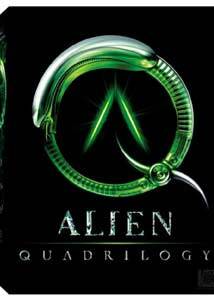 The massive, nine-disc Alien Quadrilogy release provides novices with a welcome opportunity to view a landmark picture in both the horror and science-fiction genres. Nearly 25 years after its 1979 opening, this nightmare-inducing gem still infects your consciousness and becomes nearly impossible to forget. Alien's three sequels each has its own strong points (especially 1986's Aliens), but they all owe a considerable debt to the original tale. The abundant success was actually a pretty big surprise at the time. Numerous studios passed on the project, and Ridley Scott (Blade Runner, Gladiator) had only directed one feature film prior to this one (The Duellists). Luckily, he crafts a deliberate and slowly building pace that eventually reaches a feverish pitch. The early scenes may seem to drag a bit, but they perfectly set up the audience for the surprises that follow. The plot is almost certainly familiar to most viewers, but I'll provide a quick summary here of its basic elements. The seven-passenger Nostromo mining craft has successfully gained its cargo and is returning to Earth. Intercepting an apparent S.O.S. message, they set down on an unexplored planet and discover a strange vessel. A small alien being then attaches itself to a crew member's face and is returned to the ship. It eventually transforms into a larger, more hostile enemy and begins to kill the crew one-by-one. Ellen Ripley (Sigourney Weaver) and the remaining crew must find a way to eliminate this perfect killing machine before it destroys them all. Additionally, the profit-minded Company may have ulterior motives for saving the alien and places little value on the lives of their crew. Alien takes its time and clearly depicts each setting before providing the action. The opening wide shots convey the vast expanse of the Nostromo and its practical, industrial aspects. The camera then enters the ship but doesn't immediately join the action occurring. Following several minutes of images presenting the bleak interior, we finally observe the crew waking from hypersleep. This initial sequence does not serve any definite need of the plot, but it does draw us into the specific atmosphere. When characters later race through the ship, we already understand the basic layout and can focus on the events depicted. Scott masterfully follows the example of Hitchcock and Carpenter in realizing that setup is sometimes even more important than the action itself. The renowned dinner scene perfectly exemplifies this approach and uses subtle hints prior to the violent alien appearance. One crew member, Kane (John Hurt), starts coughing and it seems harmless, and then his problems persist, and we cringe and can guess what's coming. Considering its appearance in the pre-CGI era, this picture offers remarkable set design that inventively presents a larger story beneath the surface. The massive alien ship dwarfs the little explorers and presents an unknown civilization completely foreign to humans. Surrealist H.R. Giger's inventive and horrifying designs rank among the most unique aspects of the genre's history. The long rows of eggs promise countless more nasty aliens and some grand, unknown source. The large, dead "space jockey" sitting at the chair is never really explained, but it provides a fascinating grisly image. These shots raise numerous questions but fail to detract from the central plot. The impressive cinematography of Derek Vanlint covers the unique locations while Jerry Goldsmith's deliberate music underscores the impending doom. These sounds complement the scene and allow the shots to live without bombastically overwhelming them, which keeps us focused on the experience. Horror pictures aren't usually remembered for having talented ensemble casts, but this one provides a wonderful group of character actors. Tom Skerritt initially received top billing as Dallas but actually takes a back seat to future star Sigourney Weaver's Ripley and Ian Holm's chilling science officer, Ash. Homicide's Yaphet Kotto, acclaimed British actor John Hurt, Harry Dean Stanton, and Veronica Cartwright could carry scenes on their own, but they all work effectively together. Each actor gives their character an original personality that supercedes the tenets of the script. They mostly remain subdued and avoid the overacting often seen in the genre. Even Holm remains eerily calm during his ultimate scene, which makes the expected revelation even more unsettling. This gargantuan release on DVD gives us the option of choosing between the 1979 theatrical version or the new director's cut of Alien. The original edition is very strong, and the 2003 release provides only a few minor changes without seriously altering the story. The only significant new scene involves Ripley discovering the nasty cocooned bodies of several shipmates near the film's end. Scott also chopped some lengthier moments and tightened everything to provide an even scarier experience. Image Transfer Review: This release of Alien represents a significant improvement over past versions, even those appearing on DVD. The 2.35:1 anamorphic widescreen transfer removes nearly all of the grain initially prevalent and provides a clear picture. The sharp colors present Scott's vision in excellent fashion and really draw us into the action. This quality level is suprising even for this type of grand boxed set. The new director's cut scenes retain the pristine nature and rest seamlessly within the film. Audio Transfer Review: This feature provides two excellent audio transfers, a powerful 5.1-channel Dolby Digital track and a more complex DTS version. You can't really go wrong with either one and will receive considerable chills from both choices. The rear speakers are used effectively, especially considering the nearly 25-year age of the film. The power level is also very solid, and grows to a feverish pitch near the chaotic finale. The sounds jump quickly from the speakers and engage us in a remarkable listening experience. Extras Review: The Alien Quadrilogy's true allure lies with its abundant extra features, which match the best DVDs released previously. DVD producer Charles de Laurzirika has utilized large resources to craft a brand new commentary and documentaries with nearly all the key players. Disc One features a scene-specific commentary track recorded separately from many cast and crew members. Ridley Scott appears with Sigourney Weaver and discusses some key moments, but it does lack the information of his solo commentary on the previous release. Veronica Cartwright, Tom Skerritt, and Harry Dean Stanton also speak together and provide some enjoyable anecdotes. Additional speakers include writer Dan O'Bannion, editor Terry Rawlings, and executive producer Ronald Shusett, who each talk individually. Disc One also offers a "Deleted Footage Marker" with the director's cut that identifies scenes not originally provided theatrically. Scott also discusses these moments during the commentary track. The theatrical version contains a separate menu offering the same deleted scenes. Disc Two gives us nine documentaries that start at the very beginning and intricately cover every key element of the film. Divided into pre-production, production, and post-production sections, these areas also include countless photos, storyboards, and other fun extras. Especially noteworthy is the multi-angle chestburster sequence, which showcases the construction of the pivotal scene. Individual descriptions of each element are provided in the following paragraphs. Grab a chair and relax, because reading this section will take a long time. This 18-minute documentary wonderfully takes us back to the very early concepts and script ideas for the picture. Writer Dan O'Bannion and executive producer Roger Shusett speak with glee about the initial story creation process and discuss their involvement. Their statements provide an intriguing timeline and take us through each step leading to the beginnings of production. We also hear from numerous other producers and studio bigwigs who pushed the story forward to filming. Each person speaks with refreshing candor and is willing to criticize the other major players involved, which gives the piece a freshness rarely seen on DVD. O'Bannion provides a significant text introduction to the first draft that covers his basic story ideas for the picture. This guy remains extremely passionate about the work, and his enthusiasm is catching even while only reading the statements. Much of the material matches the previous documentary, but O'Bannion goes more in depth here and really provides us with an intriguing narrative. He moves past just discussing the script and offers observations on Ridley Scott's directorial style, a lawsuit from another writer, and his own inspirations. Written on August 5, 1976, this draft contains many of the pivotal elements that would eventually make it into the finished movie. This 16-minute feature begins by discussing the tough selection of directors after all the A-list guys passed on the script. Ridley Scott and the other players talk about his involvement and the reasons for him getting the job. We view his initial storyboards and then move on to H.R. Giger's nasty, beautiful alien artwork. The artist takes us through his designs and discusses the key elements of the movie creation. This is a wonderful inclusion and provides a fascinating look at the alien design. Ridley Scott created an extensive collection of 2x3-inch thumbnails and gave detailed notes along with each drawing. The storyboards archive provides numerous photos covering the landing, breach, awaking, expedition, and the Narcissus. Both sections are great inclusions and should please devout fans, but are probably a bit much for the casual viewer. Four original artists brought their styles to craft the array of unique conceptual art. Swiss surrealist H.R. Giger created the horrifying alien images, Jean "Moebius" Giraud developed the crew's space suits, Ron Cobb generated the Nostromo's exterior, and British artist Chris Foss contributed additional ship ideas. This area provides both color and pencil renderings of many key designs from the four talented guys. This 15-minute piece covers the choice of characters and begins with the idea to convert the Ripley character to a woman. Sigourney Weaver and the creators discuss her frenetic casting call and their immediate acceptance. Her role was the last one cast, with a screen test actually occurring on the created sets. Each additional character needed to be unique, and we hear from actors like Veronica Cartwright, Tom Skerritt, Harry Dean Stanton, and John Hurt. Presented in a 2.35:1 widescreen transfer, these scenes occur on the actual sets and showcase Weaver's tough persona. Much of the material simply involves her walking through random corridors, but they do present a believable character. A commentary option allows Ridley Scott to discuss her qualities while the scenes play. This section includes black-and-white head shots, plus full crew and individual color publicity photos. It's not very exciting but does reveal a bit about the marketing concepts. Now we've moved on to the actual production and hear the stories about the arduous tasks required. The producers constantly pressured Scott to work faster and meet the budget, which raised the tension to tremendous heights. The actors speak freely about their experiences and problems during the film. Cartwright discusses the big, heavy space suits and large amounts of smoke that made life miserable for the actors. Skerritt had some problems with the time allotted and Scott's approach, but he realized the importance of the work. The set was huge and extremely claustrophobic bur really worked for the picture. This 25-minute feature provides an excellent overview and plenty of memorable material. Here is another large gallery of color photographs, now showing the actual production. Bob Penn's pictures include the Nostromo, egg chamber, Kane's fate, the other deaths, and filming in progress. Text descriptions appear before specific photos and deliver additional information. The other gallery provides script supervisor Kay Fenton's Polaroids utilized to retain specific details about the shots. This 17-minute documentary explains the production design elements of the sets and showcases the crew's remarkable talents. Surprisingly, writer Dan O'Bannion actually spent considerable time overseeing the work and was willing to criticize them. They discuss even the minute elements that could be missed but do add to the picture's success. H.R. Giger speaks about his stunning designs that remain incredible even by today's standards, and we see him working on them back in 1978. These two extensive photo galleries showcase the intricate details of the film's sets and H.R. Giger working diligently on the alien designs. Both include text descriptions and cover an array of important areas. The crew members discuss the considerable weirdness of H.R. Giger, who crafted the horrifying alien design. The interviews do make him look like a strange guy, but his amazing creativity really carried the picture to new heights. In this compelling 32-minute feature, Ridley Scott also explains the secrets of the eggs scene and the nasty items used to create the setting. We learn about the facehugger, the chestburster, and of course the full-size alien creature. The actors also discuss their surprise at the huge scene and prior thoughts about the being. They understood the basic elements, but did not realize that the blood would spray everywhere. This extra allows you to view the notorious chestburster sequence from two separate cameras or a combination of both of them. It also provides the option of hearing the original audio or commentary from Ridley Scott. Editor Terry Rawlings discusses his involvement in the project with Ridley Scott, who he had worked with previously on The Duellists. He perfectly describes the slow, deliberate pace that captivated audiences and delivered tremendous terror. The first cut was three hours and twelve minutes, and they were forced to cut certain pivotal scenes to reach the two-hour level. Jerry Goldsmith also speaks about the score and his excitement about the film. However, he actually hated the released themes and wanted to use an entirely different score. This section includes seven deleted scenes running for about 16 minutes that complement the tale but fail to provide any amazing new material. These moments were considered for the Director's Cut, but did not make it per Ridley Scott's wishes or important missing elements. One scene shows Kane coming to breakfast and interacting with the other characters off-screen, and another shot presents the whole group trying to decide how to apprehend the alien. The most extensive moments take place inside the alien ship and during a cut airlock sequence. We also view a touching scene where Ripley comforts a distraught Lambert. These scenes appear with a solid 2.35:1 widescreen transfer, and several utilize 5.1-channel Dolby Surround sound. This featurette covers the ship and outer-space effects created using grand miniatures by Brian Johnson and the other crew members. Ridley Scott was very concerned with doing the work himself and matching his specific visions for the picture. His hands-on approach didn't always connect with the effects guys, but the end result was very positive. Johnson discusses the camera work and the limitations faced by the strict budget. We also learn plenty of information about the creation and movement of the Nostromo. This collection of photos depicts the effects staff working with the models and the eventual results presented on the screen. This enjoyable, 20-minute piece describes the preview screening process and a few initial problems with sound and frightened audiences. People actually were getting up and leaving the theater to throw up during the screenings. They discuss its amazingly popular initial reception from massive crowds. Dan O'Bannion's tales of seeing the picture are especially silly but understandable. The actors and crew also provide fun stories concerning initial reactions and their overall feelings. These sections present the original marketing materials, promotional cast photographs, and pictures of long lines awaiting the premiere. I find these countless photos to be a bit much, but they do provide a more detailed overview of the film. Alien's sequels, video games, comic books, and marketing may have overstretched this story, but it remains extremely popular today. As part of the nine-disc Alien Quadrilogy set, avid fans can learn an unbelievable amount of information about the classic picture. It stands as one of the most impressive DVD releases yet and again showcases the remarkable possibilities of the format.